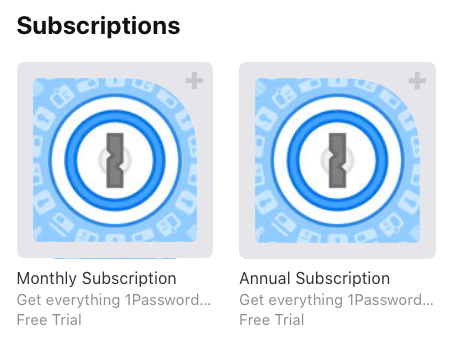 To install the stand-alone version of 1Password on iOS from the App Store, click either one of the subscription options to download the app. Note that a dialog will inform you that you are not signing up for the subscription yet, but can do so once the app is installed and you open it. When the app is installed, open it. The first thing you'll see is a prompt to authorize an in-app purchase for a 1Password subscription, reminiscent of this popular fraud strategy. Just click Cancel. Then, hit the back button in 1Password to get to the main screen. From here you can choose to sync with Dropbox, a WLAN server, etc. Once set up, you'll be running the stand-alone version of 1Password on your iPad or iPhone. Summary: dismiss the subscription dialog after install, press back once or twice to get to the set-up screen.